Kale growing leaf plant of the genus Brassica also known as Borecole, Kale can grow as perennial evergreen, annual or biennial plant also used as ornamental, grow in temperate, mediterranean or subtropics climate and growing in hardiness zone 2-10a spring planting 10a-11 in autumn planting. Leaves colors can be: green, dark green, green blue, bright green, dark purple, purple green, purple, turquoise purple, red, green red, pink, turquoise, white, black, gray, burgundy, light blue, blue and all the shades between those colors. Edges color: light green, white or pink, leaves vein color can be in: green or purple. Leaves size 5-30 cm, leaves figure can be: curly, wavy frizzy or flat sometimes with bumps, shape of the leaves: acicular, rhomboid, ovate, acuminate, pinnatisect, elliptic and more, edges of the leaf: crenate, dentate, entire, lobate, serrate, sinuate, curly and more. 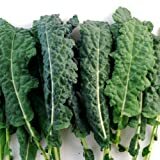 Most varieties of kale prefer cold weather, in hot summer most varieties become bitter, several varieties not become bitter in the sun and some not become bitter in shade, after cooking less bitter. (AKACR)~"CRANE BICOLOR" FLOWERING KALE"~Seed!~~~~Wonderful in Autumn! Daubenton Kale – also known as Daubenton’s kale, perennial plant that survives around 5-6 years. Green leaves with serrate edges, the edges color: light green, white or pink. Plant flowers usually infertile. 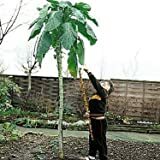 Walking stick kale – perennial plant usually survives around 2-3 years, characterized by a woody stem, with green leaves, green to dark green large leaves can reach up to 20 cm. 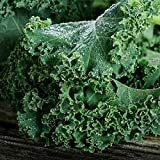 Lacinato Kale – Biannual to perennial also known as Kale dinosaur, The leaves with curly edges the leaves with bumps and remained dinosaur skin, the color of the leaves: Green blue. Also possible to eat in the summer. Curly Kale – This is the most popular type of Kale, Curly kale up annual biennial or triennial. The leaves curly and wavy with serrate edges, color: bright green to dark purple or a combination of purple green, sometimes the stems are purple. Redbor Kale – annual plant is summer kale and picking the leaves in summer. Is usually the leaves bright purple, sometimes green, purple green or turquoise purple. 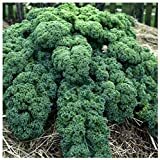 Russian Kale – is annual – biennial plant. Leaves oblong and serrated, the leaf color: green, green red or purple. In several subspecies the stems red, leaves can be with curled edges. How to make Vegetative Reproduction in Kale? What is the treatment for vegetative reproduction in Kale? Depend on verities of the leaves size 5 to 30 cm. The leaves can be in different figure: and shapes, Edges of the leaf entire or different margin. The leaves colors can be: green, dark green, green blue, bright green, dark purple, purple green, purple, turquoise purple, red, green red, pink, turquoise, white,, gray, burgundy, light blue, blue and all the shades between those colors. Edges color: light green, white or pink.